This was a fun project...co-produced with Rob Patterson..It was his idea to get a lot of bands in and do original versions of thier songs in a few days.. so we scheduled each band for 1/2 a day each to come into Arlyn Studio in Austin, and for one week solid we recorded 2 bands a day and then mixed it up in 3 days. This came out on the now defunct Watermelon label. 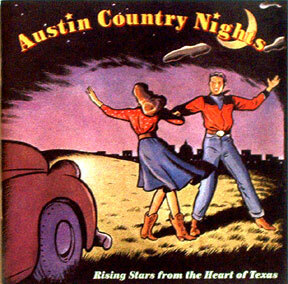 It features Dale Watson, Cornell Hurd, Jeff Hughes and Chaparral, Ted Roddy, Don Walser & The Pure Texas Band, Libbi Bosworth, Roy Heinrich, Bruce Rosison, Mary Cutrufello, The Wagoneers, The Derailers, Charlie Robison & and band we formed called Area Code 512, doing an instrumental version of "Waltz Across Texas" (featuring Gurf Morlix, Champ Hood, Donald Lindley, Casper Rawls and Scott Hinkle.) I love these kind of records. Labels should do them more often. All of these tracks do not exist anywhere else. Many of these people are legends in Austin and should have been recorded more than they were. Champ Hood and Donald Lindley are now dead and it is too bad.. they were brilliant musicians.